If you’re feeling starved of live classical music you’re in for a treat. Vivaldi’s Four Seasons, one of the most popular pieces in the classical repertoire, is coming to town. The performance will be at 7 p.m. on October 28th in the Siam Bayshore Hotel. Also on the program are two short pieces for string orchestra by Mozart. The performers will be the Silapakorn Summer Music School String Orchestra. The violin soloist is Tasana Nagavajara, one of the finest violinists in the country. Tasana was one of few violinists to be granted a full scholarship to the Menuhin Music Academy in Switzerland. 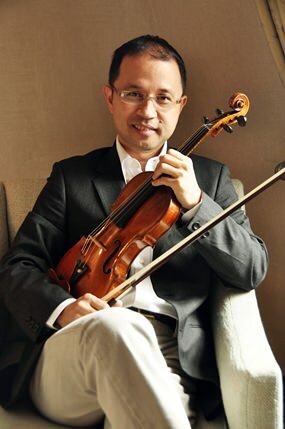 He served as Concertmaster of the Bangkok Symphony Orchestra for ten years and is invited frequently to play in Italy and Germany. The Silapakorn Summer Music School String Orchestra. Directing the orchestra will be the renowned English violinist, Leo Phillips. Both Leo and Tasana performed with the Silapakorn Orchestra earlier this year at a superb concert at Tiffany’s. The concert next month promises to be one of the musical highlights of the year for Pattaya. Tasana Nagavajara, soloist in next month’s performance. The concert will be performed in the Parkview Conference Hall in the Siam Bayshore Hotel. The hotel is located on Second Road, and can be reached from the beachfront at the end of Walking Street. The Parkview Hall is a small, intimate theatre, creating a perfect environment for a chamber orchestra. Tickets will be sold at 500 baht for adults and 250 baht for students and children over the age of six (the minimum age of attendance). Tickets can be purchased at Siam Bayshore Hotel, Siam Bayview Hotel, Wave Hotel, The Rabbit Resort in Jomtien, and the Cucumber Inn on South Pattaya Road. Have you ever felt that there isn’t enough classical music performed in Pattaya? Now there is a group working on the problem. The Pattaya Music Group is a group of Pattaya residents who got together in July with the aim of promoting regular classical music events in Pattaya. The group comprises classical music enthusiasts, both professional and amateur, such as pianist and emeritus professor of music Laurence Davis and music professor, Dr Colin Kirkpatrick. The group aims to cater to all tastes and levels of classical music. Both the experienced classical music lover and the novice who is not so familiar with the classical music will enjoy these concerts.